Our most cost effective interface. Connect one PASPORT sensor via Bluetooth® or through a direct USB connection. Collect data in or out of the classroom using computers, tablets or smart phones. The all-new AirLink is the most economical way to use PASPORT sensors. Just plug the sensor in, connect to your device using an open USB port or via Bluetooth using our simple in-app pairing and begin collecting data. The AirLink is built to last. The polycarbonate case withstands the rigor of student use and PASPORT sensors can only be plugged in using the correct orientation, preventing damage to the sensor pins or the interface. 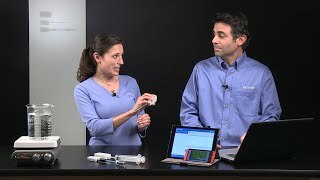 Need more than a single PASPORT sensor per lab station? Multiple AirLinks can be used simultaneously. The AirLink is compatible with our entire line of over 80 PASPORT sensors. For users of our new wireless sensors (which connect directly to your devices and don't require an interface) the AirLink allows you to make any PASPORT sensor wireless and greatly expand the range of measurements available to you. Store and organize your AirLinks. The AirLink includes a USB cable for charging when connected to a computer or other powered USB port.